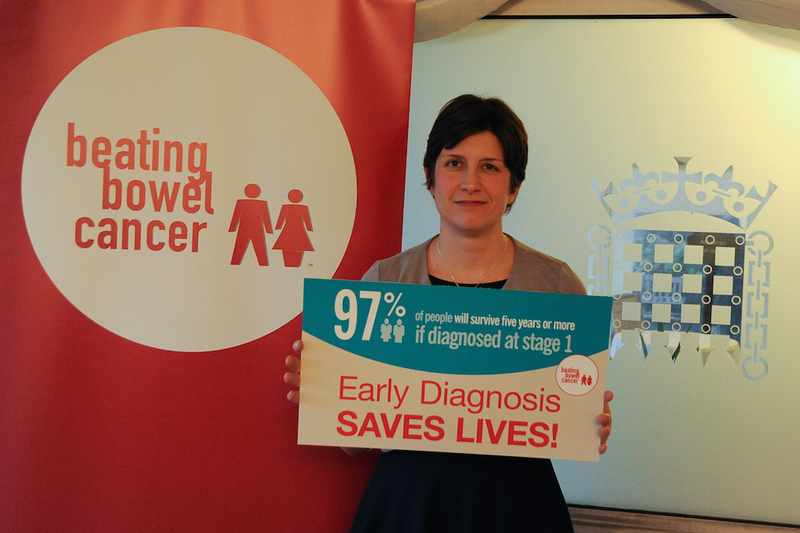 Alison Thewliss MP attended a Westminster reception hosted by the charity Beating Bowel Cancer to help raise awareness of the disease. On 27th January, the MP for Glasgow Central joined other Members of Parliament, bowel cancer patients and survivors, health professionals and members of the charity to hear more about how improving earlier diagnosis of the disease can increase survival rates. Bowel cancer is the UK’s second biggest cancer killer but this doesn’t have to be the case; if caught early over 90% of those diagnosed can survive more than five years. That figure drops to just 7% if they are diagnosed at a late stage. Speakers at the reception included Debbie and Alistair Gammage, whose daughter Hannah died of bowel cancer aged just 26; Shadow Secretary of State for Health, Heidi Alexander; Public Health Minister, Jane Ellison MP; John Baron MP Chair of the All Party Parliamentary Group on Cancer and TV presenter, Matthew Wright, who lost his father to bowel cancer. He said: “Sadly my dad died of bowel cancer so I know just how vital it is that people are aware of the disease and its symptoms. If they know what to look out for, they can get checked out as early as possible. This could save their life – but only if followed by an earlier diagnosis and quicker treatment. Mark Flannagan, Chief Executive of Beating Bowel Cancer, said: “This event made it possible for us to share our plans and outline the key policy priorities that need to be realised in the next Parliament if bowel cancer survival rates are to improve. To find out more about bowel cancer please visit the charity’s website www.beatingbowelcancer.org or call their Nurse Helpline on 020 8973 0011.